History may well record what happened on November 29, 2012, as Mahmoud Abbas’ “finest hour”. This was the day the Palestinian Authority president (right) announced to the world that he would no longer bow to blackmail from the West. A familiar political threat by Israel to withhold tax funds due the Authority, did not deter him. Nor was he moved by the insulting British tactic that a pledge not to haul Israel before the world’s criminal court, would buy the Crown’s yes vote. The U.S. State Department’s most recent contribution to the effort to force Abbas back onto the US-Israeli reservation, was both naive and arrogant. Bill Burns, the U.S. deputy secretary of state, was sent on a last-ditch begging mission to Mahmoud Abbas’ New York hotel room to persuade the PA president to “reconsider” his request for statehood status. Abbas ignored them all. As a result of President Abbas’ persistence, the resolution passed, granting Palestine a “non member observer state” status in the United Nations. The word “state” in that resolution is huge. It opens doors for Palestine and it represents a step up into international status which is, as of 11/29/12, 65 years overdue. The UN General Assembly (UNGA) approved the Palestinian resolution by an overwhelming majority, 138 in support with only 9 in opposition. There were 41 abstentions. (The vote was an improvement over the October, 2011 vote that admitted Palestine to membership in UNESCO). At present, the Vaticanis the only other state that carries the designation of a “non member observer state status”. Switzerland held the status in 2002, prior to its achieving full membership. President Abbas made his case for an upgraded status to the UN General Assembly. He delivered a passionate speech in which he centered on a theme he reiterated throughout his speech, “this is why we are here.” Thursday night, the UNGA continued in session. Until adjournment Thursday, live proceedings may be accessed here. Later this same web address will have the proceedings in its archive. Speaking in favor of the resolution, Turkey’s foreign minister Ahmet Davutoglu (left), urged the GA members to support the resolution and then work to admit Palestine to the UN as a full member. Last year, President Abbas had asked the UN Security Council to admit the Palestinians as a member state, but that request was blocked by the U.S., which holds a veto on the Security Council, the UN governing body with the authority to admit new members. Fearful of any Palestinian status advancement, Israel had been waging an intense campaign against the resolution that passed Thursday. As the voting day approached, Israel fell back on a strategy intended to put pressure on members of the European Union, calling on them to form a “moral majority” on Israel’s behalf. 6. Join the International Telecommunications Union and gain sovereign legal control over its own airwaves, phone lines, bandwidths. For compelling legal, moral, ethical and practical reasons, the United States and other Western states should join the great majority of UN member states, encompassing the vast majority of mankind, in honoring the moral obligations and legal responsibilities of the international community toward the Palestinian people by formally recognizing that, 65 years after the General Assembly’s fateful recommendation to partition Palestine, the two states envisioned by the General Assembly do indeed exist, even though one state is, temporarily, under military occupation by the other state. This is a situation which, in the interests of both justice and international legality, requires rectification through urgent and intensive state-to-state negotiations in accordance with terms of reference which are consistent with international law and relevant UN resolutions and with the full, active and determined support of the international community. Today we return to the UN general assembly, the world’s largest multinational arena, where each of 193 states has a vote of equal value and none has a veto. Supporting our bid for enhanced status at the UN is a vote for the universal values of human rights embodied in the UN charter. Opposing it would make the Palestinian people the glaring exception to universal human rights, denying us the right to self-determination. Ironically, it would constitute a collective punitive measure against us for pursuing our freedom peacefully on the basis of international law and in adherence to what should be a global rule of law. The vote has been taken. The overwhelming majority of the UNGA has rejected Israel’s continued occupation. How overwhelming was the vote? The Marshall Islands, Micronesia and Palau, all former components of the U.S. Trust Territory of the Pacific Islands, are “freely associated states” of the United States, with U.S. zip/postal codes and “Compacts of Free Association” which require them to be guided by the United States in their foreign relations. They more closely resemble territories of the United States than genuine sovereign states – rather like the Cook Islands and Niue, “freely associated states” of New Zealand which make no claim to sovereign statehood and are not UN member states. They snuck into the UN in the flood of new members consequent upon the dissolutions of the Soviet Union and Yugoslavia, when the previous standards for admission were effectively ignored. Nauru, a tiny island of 10,000 people in the central Pacific, has, since the exhaustion of the phosphate deposits which briefly made it the country with the world’s highest per capita income, had virtually no sources of income other than selling its UN votes (reliably joining the United States in voting against Palestine) and diplomatic recognitions (alone in joining Russia, Nicaragua and Venezuela in recognizing Abkhazia and South Ossetia) and housing in insalubrious tents aspiring illegal immigrants hoping to reaching Australia. I cannot begrudge Nauru. I have been there. It is an an appalling place, an island with no beaches, the world’s highest obesity rate and no real alternative to diplomatic prostitution. Accordingly, only three “real” states joined Israel and the United States in voting against Palestine and the two-state solution: Canada, the Czech Republic and Panama. They must make their own excuses. Israel’s declining support around the world has dwindled down to a tiny minority of Those Who Have Their Excuses. 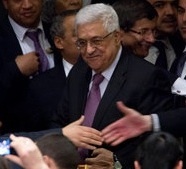 The picture above of President Abbas, taken after the vote, is by Damon Winter of the New York Times. The picture of Turkish Foreign Minister Ahmet Davutoglu is from Reuters, taken by Brendan McDermid. This entry was posted in Middle East Politics, United Nations, USA. Bookmark the permalink. Today is a memorable day for Palestine. Palestine has won more UN legitimacy from the vast, vast majority of countries around the globe. It is an important achievement that should be recognized and celebrated. Thank you, Jim, for pointing to all the important new tools this step potentially offers the Palestinian leadership. But, it is still short by one more critical step to become a full UN member state. It happened 65 years too late on the same date of the deplorable UN Resolution of 1947 to partition Palestine. In 1947, Historic Palestine had a Palestinian Arab majority of 65% vs a Jewish minority of 35% of the total poulation. However, US and British arm twisting led to the UN offering the Jewish minority 55% and the Palestinians 45% of the land. This was vastly unfair. And the Palestinians rejected such outright theft of their land. Even, the 35% Jewish minority was only 10% in 1917, (Balfour Declaration), but increased dramatically because of forced European-Jewish immigration, which led to the aggressive demographic devastation of Palestine. Yes, even though I celebrate today’s Palestinian achievement after 65 years, my heart does not “spring” because I realize that the US-backed occupiers will try to drag the next step of full UN membership for years, or decades to come, hoping to saturate the West Bank and Jerusalem with more illegal settlements and corresponding illegal Russian-American colonial settlers. Israel has advanced and enforced the One-State solution. They want ALL of Historic Palestine. Israel’s talk of 2-state solution and “talk-for-talks-sake” is a major deception to buy time. I do sincerely hope that this latest UN recognition, and the “Tools” that the new status affers, will allow the Palestinians to unite under one leadership that will start to use the “Tools” without delay, and no matte what opposition it gets from the usual suspects. Thanks for this fine report. Hanan Ashrawi’s comment says it all. Let us hope and pray that the day will come when the USA will join the world in demanding that the terms of Partition adopted by the UN General Assembly be respected by all parties. It has taken great courage for the Palestinian Authority to persist in choosing to pursue this route to a just peace within the framework of the United Nations. Let us do all we can to remove the obstacles that still stand in the way. Insightful information you will get nowhere else. Loved the part explaining the islands that constituted half the opposing vote! What a despicable shame that these islands are even allowed to vote as they amount to US colonies tied with shoe laces to their master. Great article! Why bother reading the main stream media anymore…..
Jim, for at least this day, I feel really good. Thanks for your presence in my life and the lives of all your readers. As though settlement building, the ugly and disastrous Wall, the blockade of Gaza, the occupation itself and a million acts of personal and corporate humiliation aren’t unilateral actions. Unless, that is that the consent in the form of massive support from the United States makes them somehow more than unilateral. Those of us who voted for Barack Obama need to insist that the U.S. stand up for the rights of all people, and that the Palestinians are in the front of that long line. This is long overdue, yet a beginning. The “peace process” has been a sham for decades. Israel talks peace but confiscates Palestinian land to build settlements for Jews Only. It demolishes homes of non Jews to build housing for Jews Only. This illegal and imoral behaviour is done while spouting slogans of peace, and while actual negotiations are going on! The US and Israel will continue to do their utmost to sabatage and destroy Palestinian aspirations. We have become two shameful peoples, on the side of oppression, and Israeli racism against non Jews. I don’t think Israel will change its ways. It’s apartheid and Jewsih Supremacy laws are now deeply rooted among religious Jews and secular nationalists as well. Will America change its policies towards Israel? John Whitback has it correct when he refers to the General Assembly’s “recommendation” to partition Palestine..It was never approved by the Security Council. Palestine presented a monumental challenge to the fledgling United Nations. Three Zionist paramilitary groups were waging a war of terrorism against the Mandate British to drive them out and the British, eager to oblige, announced that they would withdraw in May 1948 and turn the problem over to the UN. A UN committee convened in 1947 to decide on a plan. Only a third of the Palestinian population was Jewish, most were landless recent immigrants and refugees, and 94% of Palestinian land was Arab-owned. The Arab nations challenged UN authority to make decisions about predominantly Arab land, citing the UN Charter principle of self-determination, and refused to participate in the proceedings. This left the political game in the hands of the Zionist players. In November 1947 under heavy Zionist pressure the UN General Assembly upon recommendation by this committee issued UNGA Resolution 181, proposing a division of Palestine into two states, one Jewish on 55% of the land and one Arab on the remaining 45%. The Arabs naturally refused this offer, the British declined to implement it on this account, and massive Arab/Jewish conflict erupted. Since the British forces were committed to withdraw in five months they did nothing to stop the well-organized, well-armed, well-funded and ruthless Zionist terrorism and ethnic cleansing that ensued. “Plan Dalet” was launched by Zionist militias in March 1948 and by the time the British departed two months later, this brutal campaign was in full operation and had already committed 16 massacres and driven over 300,000 almost entirely helpless Palestinians from their homes into hastily constructed UN (UNRWA) refugee camps. After British withdrawal in May 1948 external Arab forces intervened with too little too late, and the only Arab military possibly capable of stopping the Zionists – the Arab Legion of Transjordan – had been co-opted by the Zionists in an agreement to let Transjordan keep Judea and Samaria (the present West Bank) in exchange for non-intervention with Zionist seizure of the rest. In short, they divided the spoils, the first in a six-decade series of betrayals by Arab states suffered by the Palestinians right up to Egypt’s 2006 closure of the Rafah crossing into Gaza, collaborating with Israel in the illegal collective imprisonment of 1.5 million Palestinians in Gaza behind a suffocating blockade. The UN had no intervention force and was rendered impotent in the situation, but established the right of all refugees to return to their homes in the Universal Declaration of Human Rights in December 1948, applied explicitly to the Palestinian refugees in UN Resolution 194 that same month. I identify with all that has been said in support of the Palestinians.This is a moment long overdue. My regret as an American is the continued inability of my own government to come to terms with a sense of justice in the context of the Middle East. This U.N. action is clearly a message to the administration of how the rest of the world has perceived our commitments. Now we as individuals must do all we can to move our government from political commitments to fairminded statemenship. This is great news. Until Palestine and Israel are treated on equal terms the situation will always be tense. Only justice and equality will lead to peace. This is a step in that direction. Now we need to complete the entire process. And today there is news that Israel plans to add 3000 houses to the settlements! Time to approach the International Criminal Court? Thanks, Jim, for this review and summary. So pleased for Palestine! Yes, it is unfortunate that Micronesia, which I have traveled, and the Marshall Islands where I lived for several years did not strike a blow against exploitation and oppression. The U.S. position is shameful. It will take many ” good Jews” to stop Israel’s destructive course.I hope that it will be soon! Susan Rice *yelled* her comments after the vote, as if raising her voice would make her words true! Our NO vote was an appalling display of isolationism. And paraphrasing Prof. Stephen Zunes, leaving statehood to be determined by direct talks with Israel is like letting Britain and France determine statehood for Kenya and Algeria. Imperial colonialism at its worst. Many thanks for your comprehensive analysis, Jim. The Israeli people must learn how the International Community regards Israel’s issues with Palestine. I am deeply grateful today that I am not a serving US diplomat, forced to justify our repellent policy to my local contacts and friends. We have truly lost our moral compass. Clearly, Palestine is not the only Zionist occupied country! The next step is that both Israel and Palestine formally recognize that each has the right to exist as a separate country. Palestinans including Hamas have already agreed to recognize Israel upon withdrawal to its pre-1967 borders as required by international law, subject to endorsement by Palestinian plebiscite. However, to demand them to validate Israel as RIGHTFUL would renounce their own rightful claims under international law, which is an entirely unreasonable demand. This is the difference between de facto and de jure recognition, and recognition makes very little difference beyond the exchange of diplomats. The real reason for Israel’s “right to exist” demand has much more to do with their national identity than anything practical. Israel is obsessed with its “legitimacy,” and due its establishment upon the stolen land of others, only renunciation of claims by its victims can give it a credible claim to legitimacy. To gain this, Israel must honor their rights to return and restitution rather than simply demanding it through extortion. But to do so will likely cost them their Jewish majority. A collective transformation of Israeli consciousness away from racism will therefore be necessary, much like that of Mississippi and South Africa, which can likewise be motivated by boycotts, divestment and sanctions (www.bdsmovement.net , http://www.pacbi.org and http://www.whoprofits.org.) And BTW, due to its relentless violations of human rights and international law, 32 countries including several US allies don’t recognize Israel at all, including non-Arab and non-Muslim countries. For the first time in the history of this earth God has created a nation of all religions of the world, of all races of the world and all languages of the world, the United States of America which is the most powerful and the most prosperous nation in the world. Now that there is conflict between Muslims, Christians and Jews over the Holly Land it is the responsibility of United States of America to resolve the problem and facilitate peace in the Holly Land. I do not share your views about the US prosperity. In fact it is almost bankrupt! Besides, the so-called conflict is actually nothing more than a demonstration of the power of the Zionists which enabled them to steal a country in broad daylight with the help western government that they had under their control and effectively corrupted their moral fabric; hence the US cannot act as freely and honest as most people of the world would wish.. This is indeed an incredible moment, and I pray it will lead to complete fulfilment of Palestine’s deserved rights. Israel is a country which was founded by the crime of violently pushing people off their rightful land without any compensation. The Palestinians were unarmed and unable to fight back–although no agreement had been made or signed, since the Balfour Declaration, which was not a legal document but awaited the planning and working out of a treaty to be signed by both peoples. Instead the Israelis trudged ahead with arms bought from Czechoslovakia (or so I have learned from reading) and criminally seized land, pushing off the owners (for 2000 years) before any agreement was worked out and signed. Shame on our United States foreign policy makers for rewarding the criminal and refusing to fight for true justice. ( 3 Billion a year for what, 10 or 40 years?– and money which could have been used here at home for education, infrastructure, etc). It was not for the Palestinians to redress the crime of the holocaust, horrible as that was. To add to the world another horrible crime to another innocent people, did not aid in the development of human moral behavior. Today much of the world, including myself, rejoices with Palestine. What a great day! It feels as though the exit out of the wilderness has been discovered. “They” say there can be no peace outside of the (phantom) negotiating table, but that imagery seems to be a euphemism for stall tactic. Besides, how many birthday candles are we blowing out on that thing anyway? 21? 22 going on 23? Maybe Laurie Cardoza-Moore can now pack her bags, or shall I say Zionist baggage, and go home! She is a Zionist spokeswoman who was sent to the United Nations by Dr. John Lupoli of the World Council of Independent Christian Churches as a Special Envoy to “defend” Israel. And, if Jay Sekulow’s European office wishes to continue defending the legality of Israel’s illegal settlements, the good attorney may just want to rent office space in the Netherlands. Bibi may now need him more than ever! 1. Financial support to Israel costs the US more than 10 Billion a year! The 3 Billion you mentioned is only a direct state budget aid. Add to that Billions worth of unpaid loan guarantees, funding of security projects e.g. apartheid wall, free sky-is-the-limit top of the range armaments, tax-exempt donations by financiers, etc… In a nutshell, the US Govt spends more on the Israeli citizen than its own counterpart! 2. The Zionist designs on Palestine preceded the so-called holocaust by about a century. The infamous Balfour Declaration was made on 2 November 1917. This is the best explanation I have read of the vote. Thank you for getting the word out. I hesitated before commenting since all what needs to be said has already been said, but I could not but thank you all for rejoicing with Palestine. The vote confirmed what we have known and experienced throughout those long and futile negotiations with Israel under the auspices of the US. For North American (The US and Canada) to stand alone vs. almost the whole world in blocking justice is absolutely shameful for a country claiming to be a super power and a champion of democracy. It seems to me more of a hypocrisy. And that is why we need the support of our friends now more than ever to help us move forward after this historical vote.